If you like Call of Duty series and you follow the news about its recently released instalment, then you probably know about its upcoming add-on, entitled Devastation, which will be released soon. But today we would like to tell you about a new episode in the Extinction mode, which is also a part of the next DLC. Thus, last night the developer of the series presented fresh Call of Duty: Ghosts Extinction trailer, which describes what awaits us in the new episode - Mayday - of this mode. According to the description below the video, the action of this part takes place after the events in Nightfall (the first Extinction’s episode). Here the Quick Reaction Force team has to investigate a ghost ship adrift in the South Pacific. But, as it has turned out, this big high-tech vessel has no team on it for a reason, and now all the members of the special Force department are in a big danger. Some creepy, very fast and huge creatures (for sure, they are aliens) - Seeder and Kraken - are trying to kill everyone on this ship. And you, as the member of the team, will have to meet these beings in the fight to outrance. 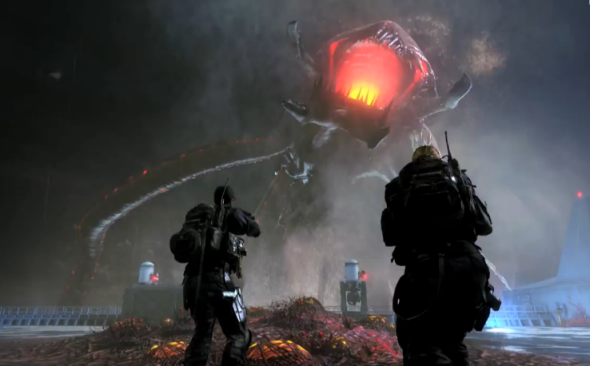 And in order you are able to understand what awaits you in the upcoming episode and to imagine how these monsters look like, we suggest you watching new Call of Duty: Ghosts Extinction trailer, published below. We’d also like to remind you that Mayday episode is included in the upcoming Devastation DLC and it will be available already tomorrow, but now only for the owners of Microsoft’s consoles.